Great Britain. Home of Formula 1™, its management and most of its teams. As the Official Watchmaker of Formula 1™, Hublot is proud to present the new F1™ King Power Great Britain, available in a limited edition of 250 numbered pieces. This F1 King Power Great Britain is rendered unique by several features executed in a range of high-tech materials directly inspired by Formula 1™, such as the carbon fiber and ceramic bezel with a circular-grained satin finish, adorned with multiple holes evoking a high performance brake disc, as well as the push-buttons for starting and resetting, and a 30-minute to 3-hour counter. The strap is made from black alligator horn back stitched onto black rubber, with red stitching. Fusion of the materials, the case is made of 18K King Gold. 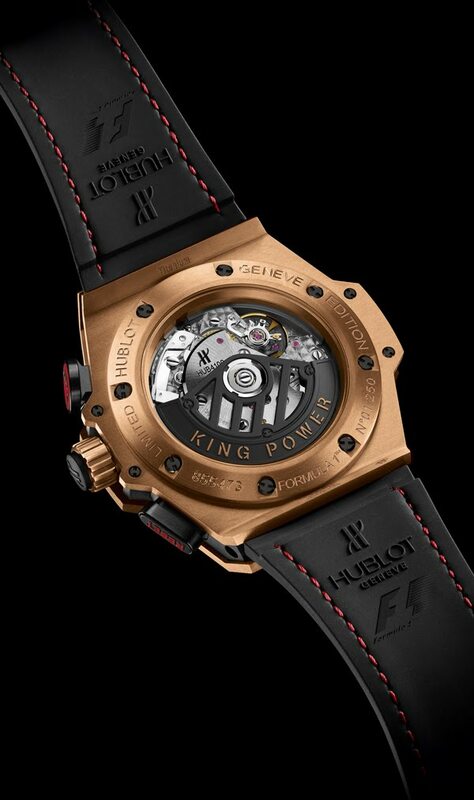 King Gold is the name of the 18 carat gold alloy used by Hublot. Its exclusive color is even redder than the traditional 5N red gold. 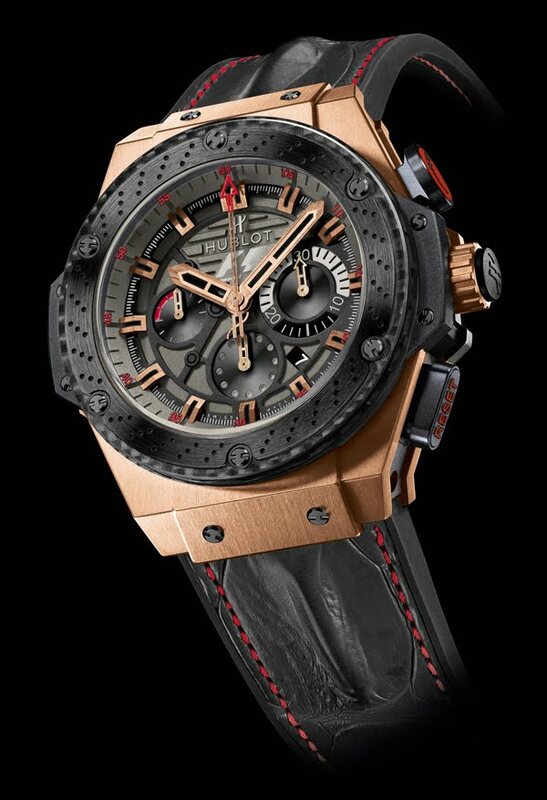 To do so, the Hublot metallurgists increased the percentage of copper and added platinum order to stabilize the colour over the years and to neutralize the oxidation. The exact composition of this alloy is classified. About Formula One™: Formula One™, which began in 1950, is the world’s most prestigious motor racing competition and is the world’s most popular annual sporting series. In 2011 it was watched by 515 million unique television viewers from 180 countries. The 2012 FIA Formula One World Championship™ runs from March to November and comprises 20 races in 19 countries across five continents. Formula One World Championship Limited is a subsidiary of the Formula One group founded by CEO Bernie Ecclestone and holds the exclusive commercial rights to the FIA Formula One World Championship™. The F1 FORMULA 1 Logo, F1, FORMULA 1, FIA FORMULA ONE WORLD CHAMPIONSHIP, GRAND PRIX and related marks are trademarks of Formula One Licensing BV, a Formula One group company. All rights reserved. For more information on Formula One™ visit Formula1.com. Sapphire Ǿ 35.50x3.00 mm, colourless.